A watercolour by Edward Burne-Jones’s longest serving assistant, Thomas Matthews Rooke (1842-1942), was the star attraction in a sale of Old Masters, 18th and 19th pictures at Roseberys London recently. The picture drew multiple bids and was eventually sold at £13,500. Phyllis Deserted – Become the Spirit of the Almond Tree (1900) takes as its subject the classical tragedy of Phyllis, Queen of Thrace, and her lover Demophoön, King of Athens. It was a popular subject with many of the Victorian Pre-Raphaelites. 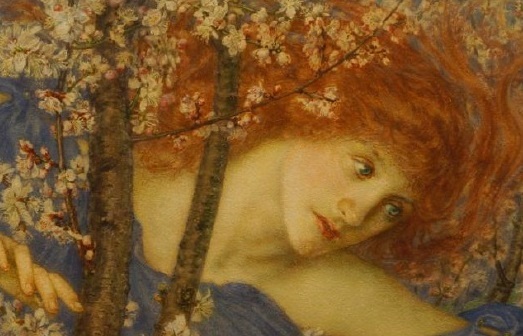 Here, Rooke depicts a red-headed Phyllis with a strikingly Burne-Jones-esque face among the branches of a blossoming tree. Rooke was Burne-Jones’s studio assistant during the period 1868-98. He was also commissioned by the famous English art critic John Ruskin to make architectural drawings. Marcus Grey, Director and Head of Roseberys Picture Department, said, “It was a beautiful Pre-Raphaelite signed watercolour, fresh to the market from the estate of the artist’s family in a modern frame, but with the remains of the original backboard attached verso”. Elsewhere, tranquillity and old-world charm were evident in two fine oils that exceeded their estimates by John Nost Sartorius (1759-c.1830) and George Morland (1763-1804). Secured above top estimate at £8,000, the Sartorius was a mature work, signed and dated 1805, depicting a sportsman with two dogs and his horse in a landscape. The Morland, showing a weary traveller and his family by a stream, made £7,500. According to a label attached to the reverse of the frame, it epitomised Morland’s post 1790 style, which developed to suit his taste of painting English rural scenes. Gypsies, shepherds and travellers resting and reposing in woodland and countryside scenes became a common theme and were considered among Morland’s best figural works. An Antonio Ciseri (1821-1891) oil of Camillo Benso, Count of Cavour, an Italian statesman who became the first Prime Minister of a unified Italy but died three months later. It sold for £1,300. A charming and decorative portrait of a French girl with her pet monkey sold for nearly three times the estimate at £6,000. Painted by the circle of Pierre Gobert (1662-1744), an artist during the reign of Louis XIV who was popular with the ladies of the court as evidenced by the large collection of portraits he executed at the time. A drawing of a furniture auction by Thomas Rowlandson (1756-1827) – the English artist and caricaturist of the Georgian era, noted for his political satire and social observation. It sold for £4,000. A 19th-century Venetian view by an unknown artist depicting the famous St Mark’s Square by a follower of the Italian painter Francesco Tironi (1745-97) sold for £2,400. A watercolour of rural Devon by George James Howard (1843-1911), c.1901, sold for £2,000.